There’s a lot of seasoned coders out there who are so stuck in the mindset that C is the fastest language, that they are willing to use antiquated and sometimes dangerous coding practices. I came across this on the Arduino forums recently . . .
Not if you know how to manipulate strings. It’s a crutch. Everything it does. it does using the wrapped string object. The overhead is NOT worth it. Well, hang on. Regardless of your knowledge of C strings, it IS easier to read, it’s easier to write and (depending on the implementation) avoids virtually all the pitfalls of C strings. 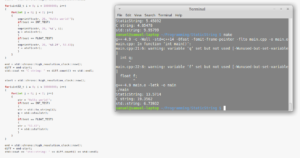 C++ string libraries can be very worthwhile. I get that the Arduino String library is far from ideal, but what I object to is the mentality that C strings are superior in terms of performance to the C++ contenders. There’s an element of truth to that, but in exchange for marginal performance benefits, C strings offer absolutely no protection at all against most common faults. In fact, functions such as sprintf are prohibited by most high integrity coding standards. I believe using C strings is akin to removing the wind-shield from a convertible car to reduce wind resistance. It might go a little faster, but sooner or later you’ll get hit in the eye by a bug and you’ll be left questioning your ability to make decisions. It’s fast because it skimps on safety! StaticString vs C string vs std::string. 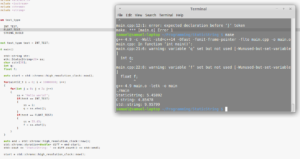 int to string and string to int performance. sprintf & atoi are fastest at converting integers. 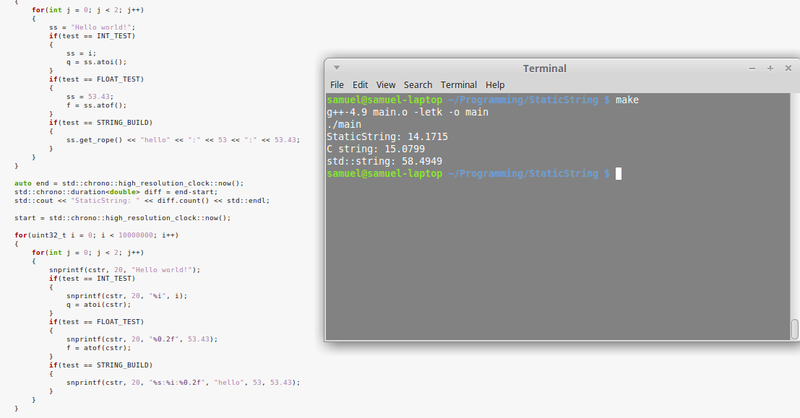 StaticStrings are 0.6s slower and std::string trails by 5.1s. StaticString vs C string vs std::string. Float to string and string to float performance. 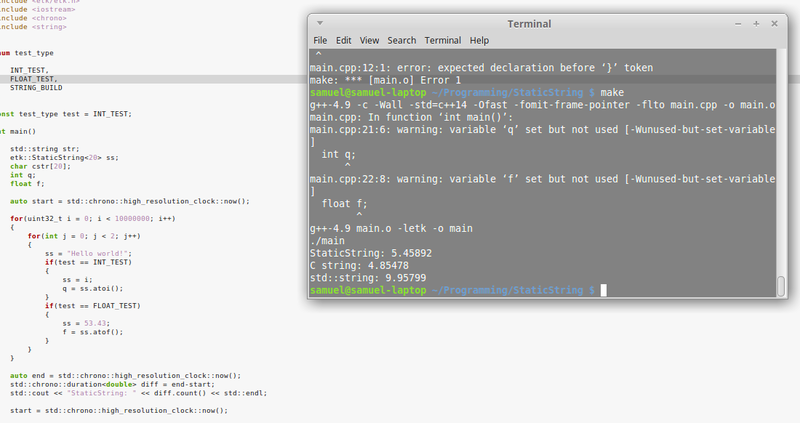 std::string was the surprise winner at converting floats to strings and back. std::string destroyed the competition. StaticString came second by 6.8s and sprintf/atof lost by 12.6s. 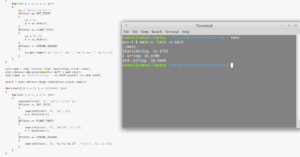 StaticString wins at building strings. StaticString is actually a little faster than sprintf and a LOT faster than std::stringstream when it comes to combining strings, int and floats into one string. 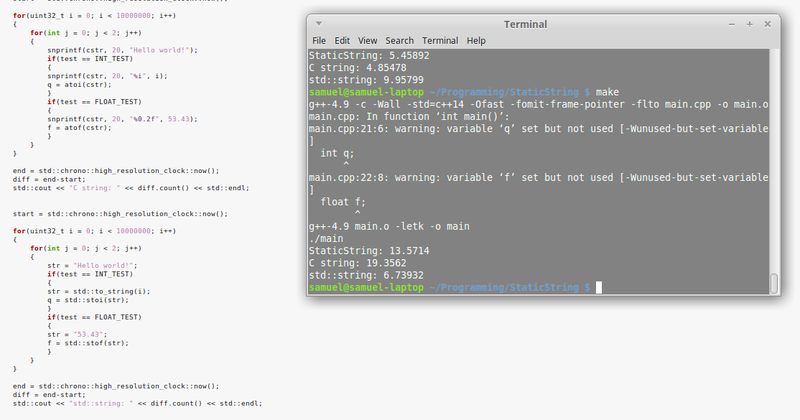 StaticString is definitely a sound alternative to raw C strings. In addition to their low memory footprint and great speed, they offer a very convenient C++ interface with easy operator overloads for most common tasks and they protect against issues that have historically plagued C strings.